آلفی آلن (اینگیلیسجه: Alfie Allen) بریتانیالی اوْیونچو. ۱۲ سپتامبر ۱۹۸۶ ‏ ایلینده لندن شهرینده دۆنیایا گؤز آچیب. ↑ Murray, Rebecca. 2011 SCREAM Awards Nominees and Winners. About.com. IAC. آرشیولنیب اصلی نۆسخه‌دن on 16 January 2013. یوْخلانیلیبJanuary 16, 2013. ↑ The 18th Annual Screen Actors Guild Awards. Screen Actors Guild Award. Screen Actors Guild (January 29, 2012). آرشیولنیب اصلی نۆسخه‌دن on 19 June 2012. یوْخلانیلیبJune 7, 2012. ↑ "SAG Awards Nominations: ‘12 Years A Slave’ And ‘Breaking Bad’ Lead Way". Deadline Hollywood. December 11, 2013. Archived from the original on 11 December 2013. Retrieved December 11, 2013. ↑ Hipes, Patrick (December 10, 2014). "SAG Awards Nominations: 'Birdman' & 'Boyhood' Lead Film Side, HBO & 'Modern Family' Rule TV – Full List". Deadline Hollywood. Archived from the original on January 26, 2015. Retrieved January 26, 2015. ↑ Empire Hero Award. Empireonline.com. Bauer Consumer Media (2015). آرشیولنیب اصلی نۆسخه‌دن on 14 July 2015. یوْخلانیلیب1 April 2015. ↑ SAG Awards: The Complete Winners List. The Hollywood Reporter (January 30, 2016). آرشیولنیب اصلی نۆسخه‌دن on August 22, 2016. یوْخلانیلیبJanuary 29, 2017. ↑ Nolfi, Joey (December 14, 2016). SAG Awards nominations 2017: See the full list. Entertainment Weekly. آرشیولنیب اصلی نۆسخه‌دن on January 11, 2017. یوْخلانیلیبDecember 14, 2016. 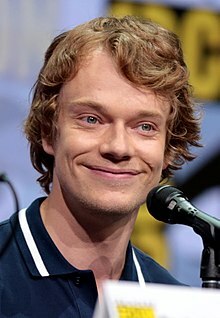 اینگیلیسجه ویکی‌پدیاسی‌نین ایشلدنلری طرفیندن یارانمیش«Alfie Allen»، مقاله‌سیندن گؤتورولوبدور. ( ۲۲ ژانویه ۲۰۱۸ تاریخینده یوْخلانیلیبدیر). قارداش پروژه‌لرده آلفی آلن گؤره داها آرتیق بیلگی‌لر تاپابیلرسینیز.